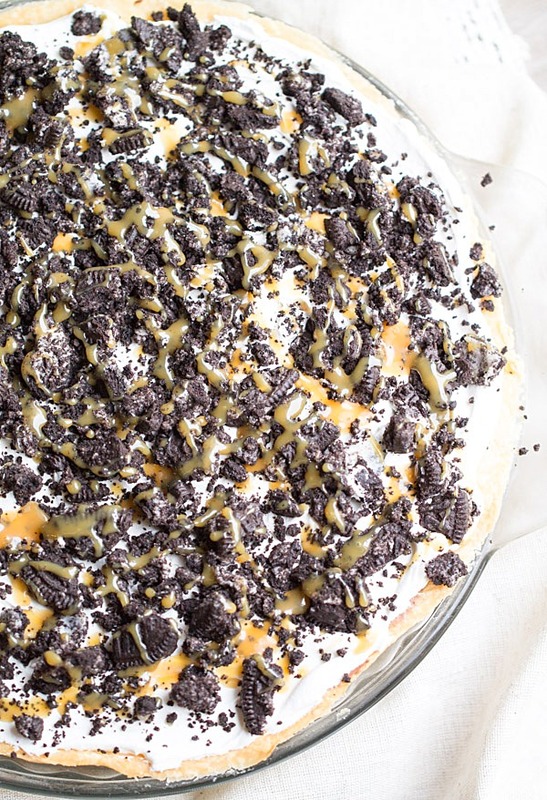 I told you about my current sweets craze/obsession when I shared this Twix Ice Cream Pie yesterday. 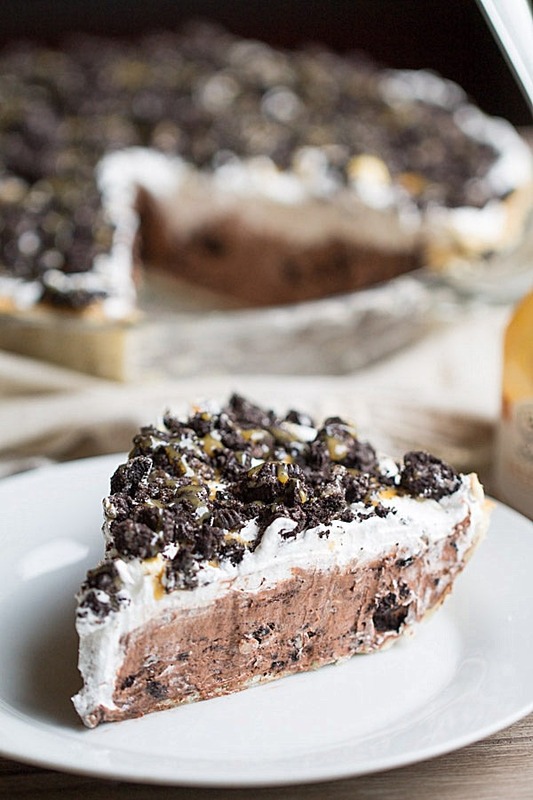 Now I’m going to talk about an equally crazy good, sinfully delicious no bake pie: Cookies and Cream Chocolate Pudding Pie. What was your favorite type of ice cream when you were a kid? Mine – COOKIES AND CREAM! I remember when we were at my grandma and pop’s house, my grandma always used to make my brother and I milkshakes. Hands down, my request was always a cookies and cream milkshake. What kind of ice cream do you want, Julie? Cookies and cream. What kind of milkshake do you want, Julie? Cookies and cream. To this day, cookies and cream is sill my favorite type of ice cream. Oreo cookies are what makes cookies and cream ice cream so special. Those two little crunchy chocolate sandwich cookies separated by that creamy cream cream make one of the best things the habitants of this planet have ever tasted. So anyways, about this pie. I know I said a lot of stuff about ice cream at the beginning of this post. But there isn’t any ice cream in this pie. 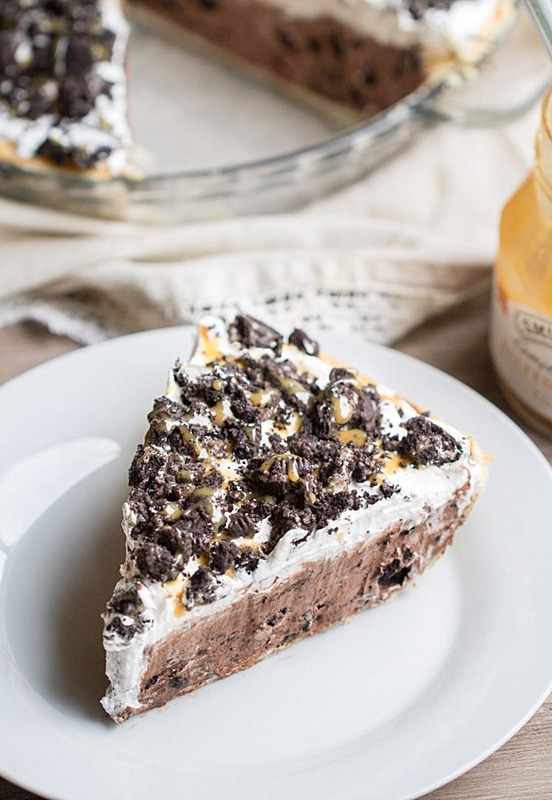 There are six simple ingredients in this Cookies and Cream Pudding Pie: pie crust, Cool Whip, chocolate pudding, chocolate sandwich cookies, milk and salted caramel sauce. Notice I said chocolate sandwich cookies. I didn’t use Oreo cookies. I used the Back to Nature chocolate sandwich cookies, which taste just like Oreo cookies. No joke, there weren’t any regular sized packs of Oreo cookies in the grocery store I was shopping in and I wasn’t going to purchase a ginormous package of them. Things could get dangerous with giant packag of Oreo cookies in my house. As if they weren’t dangerous enough with this pie just sitting around, waiting to be devoured. A few things you should know about this pie. It isn’t made from scratch. It uses boxed pudding mix and a store-bought pie crust. Gasp. If boxed mixes or pie crusts aren’t your thing, then this recipe probably isn’t for you. 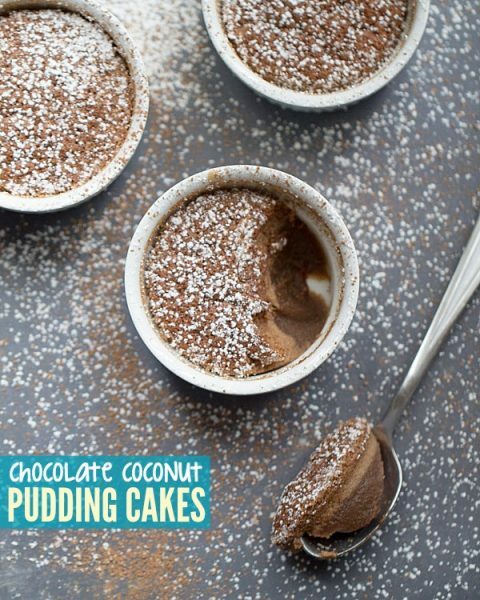 There are a ton of great made from scratch pudding and pie crust recipes on the internet and in cookbooks so if only eating foods made totally from scratch is your thing, I’d suggest checking out some of those recipes. While I love making things from scratch, I’m a pretty busy gal and just don’t feel like slaving away in my kitchen all the time. So sometimes I’m lazy. And when I’m lazy, I don’t mind cutting corners and using boxed mixes to make some of my sweet treats. If it means that I will have time to spend on other things, then it’s for me. 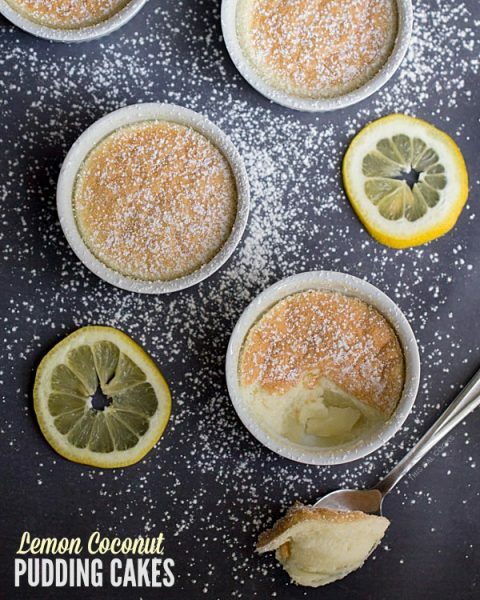 I know a lot of you are the same way so that’s why I like to share some of these quick and easy, not made from scratch recipes on my blog. For those of you who are like “woohoo hooray for easy recipes that take less than 30 minutes to make” I present to you one of the best semi-homemade pies ever: the Cookies and Cream Chocolate Pudding Pie. Enjoy! In a mixing bowl, whisk together the pudding mix and the milk. Stir in half of the Cool Whip and mix well with a spoon. Mix in half of the cookies. Scrape the mixture (it will be thick) into the pie crust and refrigerate for about 20 minutes or until firm. Spread the remaining Cool Whip over the pie with a rubber spatula. Sprinkle with the remaining cookies and then drizzle with the caramel sauce. I’m drooling a little! How delish. Thanks for sharing. YOu’re welcome, Leslie! Thanks for stopping by! Me too! We finished this pie off tonight. I may have shed a tear. And I may have to make it again stat! I’m going to have to hide this from my husband! Wow, this looks delicious! Oh my gosh you have been eating delicious desserts lately! I want a slice of this pie too! I have! Probably a little too much but they are totally worth it! And because of this, I’ve been getting up and running and walking before work! Heh Heh, I have a hard time saying no to Oreos or anything like Oreos as well. Quite possibly the best snack cookies EVER! Thanks for stopping by, Amy! I like making my food from scratch but I’d never ever ever say no to a pie this delicious which I can make in 30 minutes. How fabulous is this??? And it looks so delish! A FANTASTIC chocolaty pie loaded with chocolate sandwich cookies and drizzled heavily with salted caramel sauce in less than 30 minutes? PLEASE SIGN ME UP! 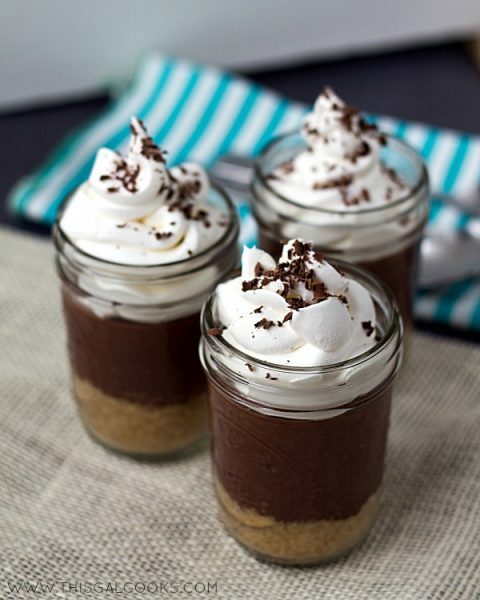 <3 This looks BEYOND DELISH! Thank you! I’m already dreaming of making another one. My boyfriend and I finished off the pie a couple days ago and I want more! It’s so darn good! Thanks, Zainab! I love the sweets streak too. In fact, I have a couple more lined up to make this weekend. I’m so bad!!! I love the addition of caramel on top!! Yummy. Thanks, Jenn! The addition of caramel was such a great idea! 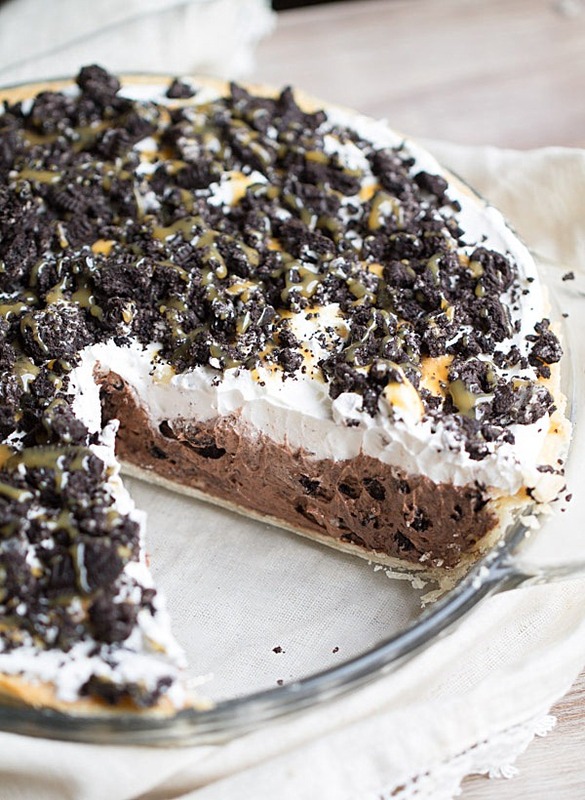 Is this a pie that can be made the day before and still hold up nicely? Looking forward to making it for the holidays! Yes, you can make this a day ahead of when you want to eat it. Store in a refrigerator and it will be just fine! Just a quick question, do you add the milk to the already made pudding, or is that the milk you add to the powder to make the pudding? Might be a stupid question but im a little confused..
You mix it with the powder to make the pudding. I’ll update the recipe to say pudding mix! Thank you Julie. The reason i asked is because i live in europe and we dont have instant pudding like in america. Its made a little different. So that got me confused and i added the milk to the aldready made pudding, which ended up being more liquidy. Its in the fridge now, is there anything i can do to save it? or will it eventually thicken??? You’re welcome, Kristina. I’m not familiar with the method for making pudding in Europe but I’m thinking that is probably won’t set since the milk was added to it after it was already made. If it isn’t thickened within an hour, I don’t think it will. Let me know how it turns out. I’ll look into the method used in Europe and see if I can help out! Oh yum! Hope you enjoyed the pie, Paula! 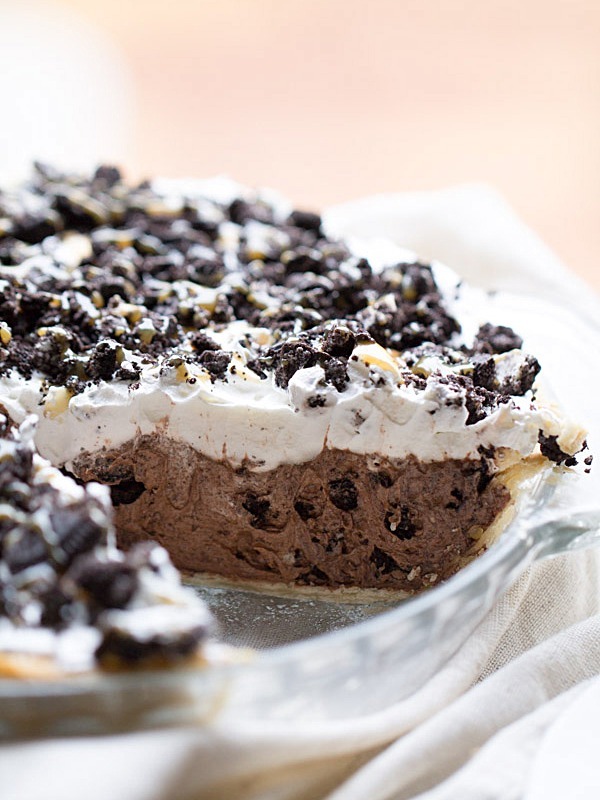 Did you notice if the cookies within the pie, and on top became soggy? Or did you find a way to avoid this from happening? They loose some of their crunch but they don’t become soggy. Made this 2 years in a row for Thanksgiving.. Had to say thank you for the recipe! Everyone, including myself LOVE IT!